Sarah Vardy (Sophie) and Tyler Duncan (Raymond) in City Opera Vancouver's Nigredo Hotel. 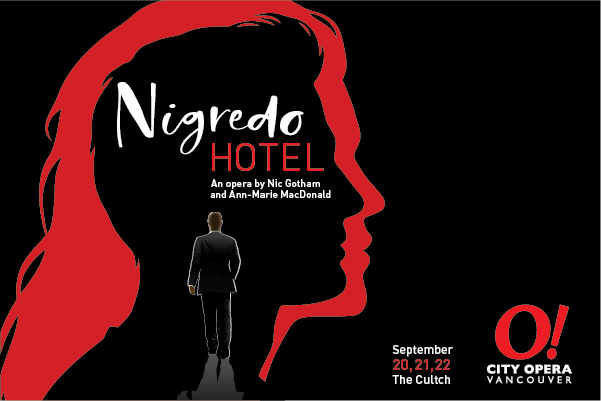 City Opera Vancouver opens its 2018 season this week with a new production of the classic ’90s Canadian opera, Nigredo Hotel. An intriguing blend of genres, the one-act chamber opera is a “bizzare, comic and macabre” psychological thriller, simultaneously “sarcastic and sweet, witty and strange…and like nothing City Opera has done before,” says Charles Barber, the company’s Artistic Director. Set in a shoddy hotel named after the Jungian concept of Nigredo or “dark night of the soul,” the opera follows the relationship between Raymond, a troubled neurosurgeon and Sophie, the “beautiful but crazed hotelier.” A fateful car accident leaves Raymond stranded at the doorstep of Sophie’s hotel, sparking off an encounter that leaves him questioning how she seems to know so much about his life. The answer is gradually revealed through the course of the opera as they both embark on a dark, spiritual journey of Jung-inspired self-discovery. Nigredo Hotel “really explores the relationship with oneself,” elaborates Stage Director Alan Corbishley. Its themes of self-awareness and navigating a state of mental turmoil will “hopefully allow audience members to reflect on their inner selves and the psychology of life,” he says. “It’s about rediscovering one’s childlike soul,” adds baritone Tyler Duncan, and revisiting the youthful sense of wonder and curiosity that we tend to let fade out of our lives as adults. Nominated for eight Dora Mayor Moore Awards after it premiered in Toronto in 1992, Nigredo Hotel is considered one of the most successful and widely performed Canadian operas ever. It’s fascinating libretto, written by celebrated Canadian novelist Ann-Marie Macdonald draws on concepts from alchemy and Jungian psychology, set to the dramatic, jazz-heavy score composed by the late Nic Gotham. Award-winning Canadian baritone Tyler Duncan will be making his City Opera Vancouver debut playing the role of Raymond this week. Duncan has previously performed at Metropolitan Opera, Spoleto Festival and Pacific Opera Victoria as well as giving recitals across Canada, Europe and North America. Dramatic soprano Sarah Vardy returns to City Opera Vancouver as Sophie, the show’s second lead. Vardy specializes in dramatic repertoire and has performed opera, oratorio and concerts across Canada, Europe, Mexico and China to great acclaim. For Vardy, the role of Sophie presents an opportunity to delve into a very different style of opera—a break from the usual Verdi and Wagner she sings while stationed in Europe. “That’s why I sort of fell in love with it, because it’s such a departure from the characters that I’ve played before like a Tosca or a Butterfly,” she says. The show’s aesthetics are similarly a far cry from the flowy costumes and fanfare of the roles Vardy usually plays. 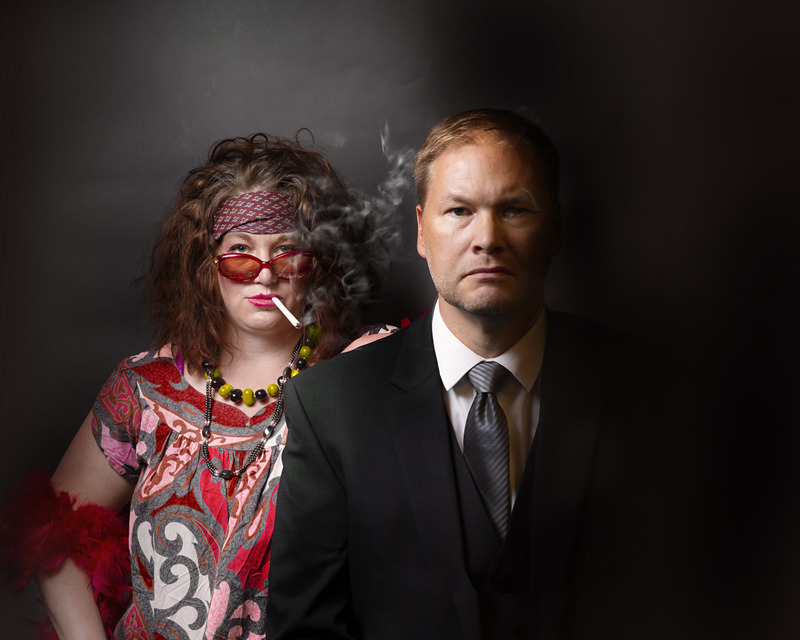 She opens the show as Sophie in a lurid, 60s-inspired muumuu, disheveled and smoking a cigarette—in stark contrast to Duncan’s crisply suited, well-dressed Raymond. For Duncan, the music provides a fond flashback to his time studying jazz as a student in Vancouver—and a chance to navigate an unconventional musical setup. “Usually, with opera you sing loud and over a whole orchestra but this is different, there’s these real, intimate moments, there’s some unaccompanied parts, there’s…driving jazz rhythms, some beautiful ballads and it goes to the extremes of both the soprano and the baritone range,” he explains. Instead of a traditional orchestra, a four musician-team will bring Nic Gotham’s “beautiful and haunting” score to life, with electric guitar, piano, clarinet and a percussionist playing an astonishing 21 different instruments (“an acrobatic feat,” marvels Duncan). Audiences are going to “go nuts for the music,” he declares, which blends jazz, musical theatre and traditional operatic elements like arias and recitatives for a completely unique musical experience. With set design by John Webber, the production will transport audiences into the mind of the disoriented Raymond—literally. “The stage is meant to actually be set up inside a head, inside a human head,” reveals Vardy. “It actually has the feeling of the movie Inception a little bit because time kind of stops and you’re kind of going into their minds and into this place where time and space doesn’t really exist,” adds Corbishley. With its intriguing storyline, English libretto, varying musical styling and 60-minute running time, the bite-sized opera promises to be both accessible and absorbing. For Vardy, Nigredo Hotel will be an experience she hopes audiences will find unusual and thought-provoking.